Each time I’ve potty trained my girls – at some point – I end up in tears and find certain evidence of my inadequacy as a parent. It usually gets so bad – and I should tell you I am a generally confident and competent person – that I begin to suspect someone else, anyone else, is more qualified to raise my children. Potty training has messed with my mindset because I let pop culture take up too much space – crowding out basic tools and concepts we learn from Lifeways, Waldorf, and Rudolf Steiner insights. Fortunately, the recent gift of some gentle guidance about “educating the will” got me back on track. So, when I found my experience different than these spirited, optimistic, and confident parents I felt like a failure. How quickly we take on the messages around us and become burdened by them. 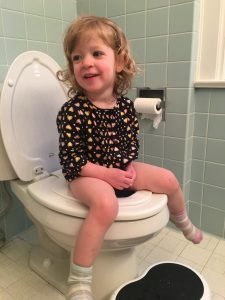 But then a kind Lifeways and Waldorf educator, Judy Frizlen, provided some critical insight and reframing for me that has completely changed my relationship to potty training. Ah. Already I felt relief. But then, this was the first time I had really tuned into the phrase: “Educate the will.” Emotionally and intuitively I immediately connected to what she said. I knew it was true. The problem was, I didn’t exactly know what it meant. Likewise, we all must learn to take care of our need to use the toilet in a way that is pleasant and sanitary to us and those around us. It is work that serves us as individuals and our social group. For my girls, I always took a couple of days and we used the potty very frequently – every 15 minutes or so. But then, once they started to get the hang of it, it’s important to set a frequent and feasible long term rhythm for bathroom breaks. For instance, we use the potty: immediately when we wake up, after we finish our snacks and meals, before we go outside, before we go for a rest. This provides plenty of regular breaks. Observing your child’s natural rhythm while she is still in a diaper can be helpful but know too that she can adjust to the rhythm you set if it is logical and frequent enough. And here, it serves to remind the adults, as I needed reminding, that the work of potty training is not over in 3 days, or 1 day, or (gasp!) 5 seconds. The rhythm must be maintained and upheld for quite some time (months, years). In fact, you may even find yourself reminding your teenager or spouse to use the toilet before a long trip in the car! Likewise, through repetition we are creating the inner mantras of our children and it will take time to imprint “tell mama when you need to go potty” and “wipe, flush, wash.” These are all things we must do. We must stop playing, or interrupt our thoughts and our pleasures to take care of toileting needs. The reminder that I am “educating the will” as I potty train, truly saved my sanity. All of a sudden, I saw the long game of this effort and felt much less tied to these ideals of 3-day, 1-day success. For we are not raising these littles for overnight success but a whole-hearted lifetime. 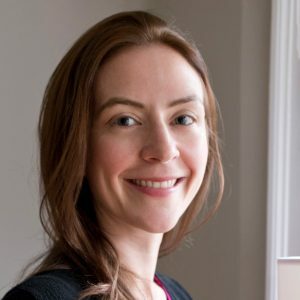 Marijke Kemble is a mother to 2 daughters – Marnie Willow (5) and Olive Celeste (2.5) and lives in Buffalo, N.Y. with her husband Dennis. She found herself completely vexed by potty training even though she is surrounded by the incredible support of close family and the wonderful program at the Rose Garden Early Childhood Center in Buffalo, NY.